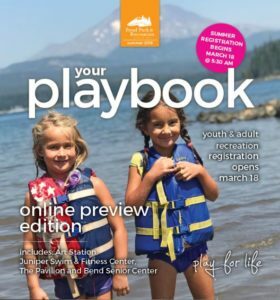 Youth Learn to Fish Event – Free! Come celebrate our country’s independence on July 4th with Bend Park & Recreation! 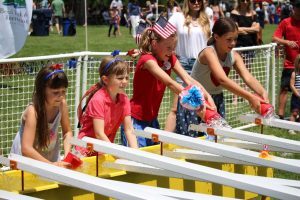 Start out your day’s festivities with the Pet Parade through downtown Bend then follow up with the Old Fashioned July 4th Festival in Drake Park from 11:00 am – 4:00 pm. 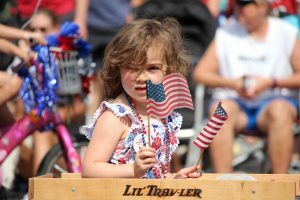 Bring your pet or stuffed animal to the Pet Parade in downtown Bend on Wednesday, July 4th, 2018. Line-up at 9:00 am for the parade at 10:00 am. Afterwards, enjoy the music, games, arts and crafts booths and food at the Old Fashioned Festival in Drake Park from 11:00 am - 4:00 pm. Let’s Picnic at Kiwanis Park – Free! Let’s Picnic at Rockridge Park – Free! Let’s Picnic at Hollygrape Park – Free! Let’s Picnic at Providence Park – Free! Let’s Picnic at Orchard Park – Free! Let’s Picnic at Al Moody Park – Free! 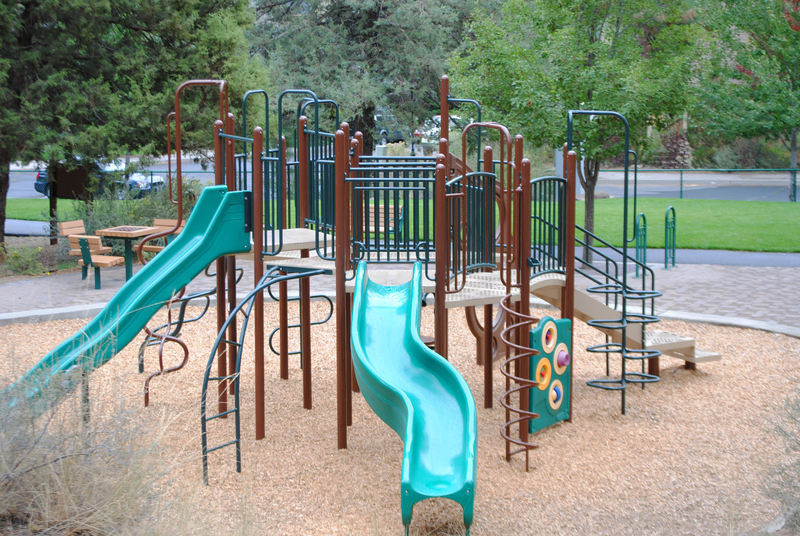 This park is located adjacent to City of Bend Overturf Butte Reservoir property. It provides access to the Cascade Highlands Trail and features a horseshoe pit and playground in addition to benches on sitting plaza. Above this park on Overturf Butte Reservoir you’ll find a dog off-leash area near Skyliner Summit Loop. Volunteers help keep Bend’s parks, trails and off leash areas beautiful and safe places for everyone to enjoy! 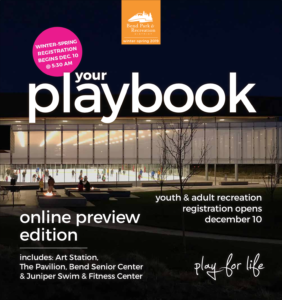 Groups, businesses, schools, families or individuals can adopt a park, off leash area or section of Bend’s urban trail system. Volunteers help care for their adopted space by visiting regularly all year – picking up litter, pulling invasive weeds and keeping an eye out for vandalism, weather damage and potential safety hazards. Volunteers make at least a one year commitment and complete a monthly volunteer activity report. Your group can make a big impact by helping with a landscape maintenance project in a park. Opportunities may be available in spring and fall, depending on the weather and vary based on the size of the group and current District needs. Projects are typically 2-3 hours and may include activities such as raking planting areas, spreading bark or playground chips, pulling invasive weeds and picking up litter. BPRD staff provides support for your group’s efforts and supplies any tools or materials needed for the project. Play, walk and run off-leash at eight off-leash areas. No matter the activity or adventure, it’s important that dog owners manage their dog responsibly so that everyone can enjoy the parks and trails. Dogs are to be leashed up in public except in official off-leash areas. Dog owners are to clean up after their dog. To help out, dog waste bags and trash receptacles are available at many Bend parks and trails. The intent of these rules is to create a safe and enjoyable atmosphere for all park users. No aggressive dogs allowed. Immediately remove your dog from the park if it is misbehaving or acting in an aggressive manner. Keep dogs on leash outside designated off-leash areas. Pick up and dispose of your dog’s waste. Remain in visual site and voice control of your dog at all times. Carry a leash for each dog in your care. Closely supervise young children. Children under the age of 12 may not be in the off-leash area unsupervised. Accept responsibility for any damage or injury caused by your dog. Bring no more than three dogs to the off-leash area at any time. Do not bring a dog in heat to a Bend park. Do not bring a puppy without a complete cycle of vaccinations to a Bend park. Display tags showing proof of current license and rabies vaccinations on all dogs. Comply with all other park rules. Please be courteous to neighbors and control excessive barking. Download a Visitor’s Guide to Dog Parks with tips for having a positive experience at a dog off-leash area. Not all dogs are child-friendly. Do not allow your child to approach or pet a strange dog without the owner’s presence and approval. A running, squealing or screaming child may become a target for many dogs, because the child resembles an injured animal or prey. Do not let your child have toys or food in an off-leash area. Children are more susceptible to contracting intestinal worms and other infections from touching grass where feces or urine are present. Be sure your children (and you) always wear shoes in an off-leash park area and wash hands after touching dog play toys. When it comes to off-leash areas, a designated space for small dogs to have a play and activity level that's in their proportion rather than with big dogs can be a great option for small dog owners. Currently, there are fenced small dog areas at Riverbend, Pine Nursery and Ponderosa Parks. The criteria for small dogs is less than 15 inches at the shoulder and under 25 pounds. Bob Wenger Memorial Off-Leash Area at Pine Nursery Park - 3750 NE Purcell Blvd. Ponderosa Park - 225 SE 15th St. 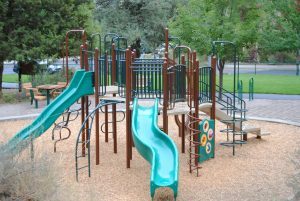 If you would like to comment on the small dog parks, email us at info@bendparksandrec.org or call (541) 389-7275. Learn more about dog-friendly parks and off-leash areas.